On a whim last year we decided to head to New Orleans to celebrate Christmas and New Year’s Eve. It turned out to be one of the best holiday season vacations ever. New Orleans is a fantastic city in which to celebrate the holidays. New Orleans is always looking for an excuse to celebrate, and the holiday season is no exception. Christmas in New Orleans is not only festive, it also lasts longer in New Orleans than other holiday destinations. New Orleans’ New Year’s Eve is perfect for travelers who want to experience one of the country’s biggest New Year’s Eve celebrations without being packed like sardines in the crowds of New York City’s Times Square. New Orleans lights a large Christmas tree every year in the French Market, but New Orleans’ Christmas decorations don’t just stop there. The entire French Quarter is decked out in Christmas finery. New Orleans’ Christmas decorations aren’t just your run-of-the-mill wreaths and lights. 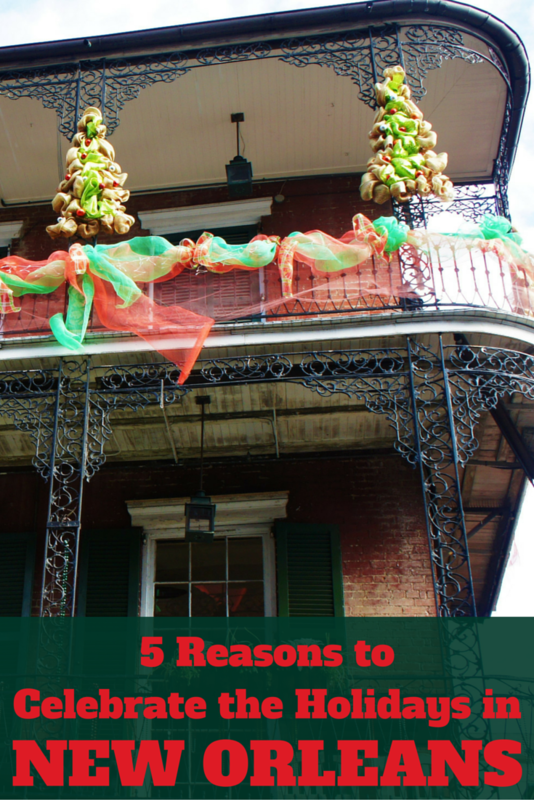 Houses are decorated with Christmas crocodiles, Christmas New Orleans streetcars, voodoo-inspired decorations, and everything else you can imagine. Even the house museums and plantations of New Orleans are decorated in era-specific Christmas decorations. Christmas in New Orleans doesn’t end December 25. Christmas in New Orleans lasts until January 6, the date of the epiphany, which means all those Christmas decorations can be enjoyed all the way through the first week of January. This also means you can celebrate Christmas with your family at home, then hop on a plane and celebrate Christmas in one of America’s most festive destinations, The Big Easy. Restaurant menus in the city are filled with traditional New Orleans foods. Many restaurants in New Orleans follow another food tradition by offering a special dinner menu for the Christmas season. The Réveillon is an old Creole custom. Reveillon means “awakening” in French and in the early 1800s was a big meal enjoyed when the family returned from midnight mass. New Orleans revived this old tradition in the 1990s and New Orleans restaurants serve réveillon menus for a month, ending on Christmas Day. Réveillon menus are prix fixe and can range from traditional to high-end. We chose to have our réveillon dinner at The Bombay Club, a cozy, dark, leather and wood restaurant that makes you feel like you’ve time traveled back about a hundred years. The Bombay Club’s réveillon menu consisted of three courses which ended with brandy milk punch, a traditional New Orleans cocktail, and cookies, the perfect treat to leave for Santa when he comes to New Orleans. My favorite souvenir to purchase on any vacation is Christmas ornaments for our Christmas tree. At Christmastime, we love to hang ornaments from our travels and reminisce about all of the wonderful trips we have enjoyed together. Some of the best Christmas ornaments can be found in New Orleans in the shops along Royal Street. New Orleans Christmas ornaments include fleur de lis, mardi gras masks, streetcars, and voodoo dolls. While New York City’s New Year’s Eve celebration may be the most famous in the United States, New Year’s Eve in New Orleans is also a big production. New Year’s Eve in New Orleans centers around a historic building in the French Quarter, the Jackson Brewery building, also known as Jax Brewery. Every New Year’s Eve a statue of Baby New Year appears on the rooftop of Jax Brewery. As the countdown to the New Year begins, a lit fleur de lis on the rooftop begins its drop. It lands at the stroke of midnight and the New Year ignites as fireworks burst out above the Mississippi River as well as along the entire horizon surrounding New Orleans. Even when the fireworks are over and everyone is heading back home or to the bars, New Orleans on New Year’s Eve continues to be festive with the sounds of When the Saints Come Marching In filling the streets. We had the unique once-in-a-lifetime privilege of joining in the celebration from the top of Jax Brewery, but there are multiple places to celebrate New Year’s Eve in New Orleans. Crowds gather in Jackson Square and along Decatur Street to watch the drop of the fleur de lis. A slightly less crowded place to join the festivities is the Moon Walk, a promenade that hugs the banks of the Mississippi River behind Jax Brewery. This is a great place to both watch the fleur de lis drop and see the fireworks. We were also told by a local that another place to enjoy New Year’s Eve fireworks in New Orleans is from the Westin parking garage, though we haven’t tested this for ourselves. If you’re looking for a memorable holiday travel destination, New Orleans is the place to be.